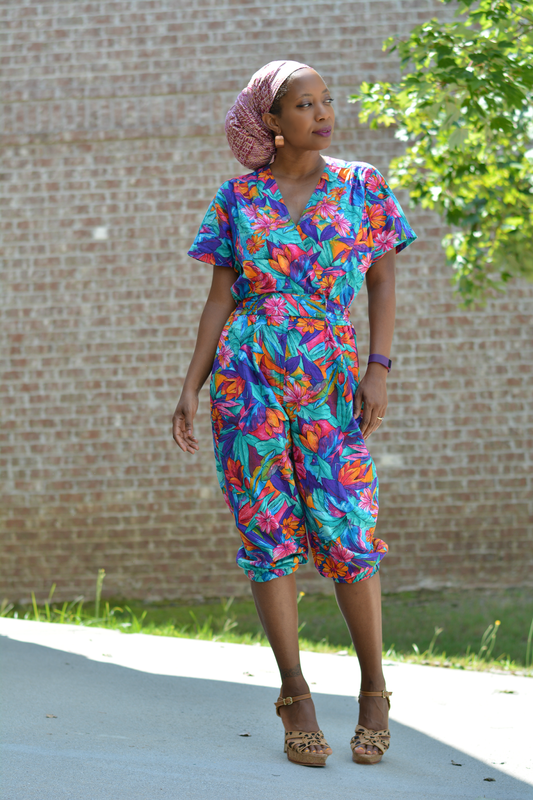 I thought I was out of my jumpsuit phase then a bright floral vintage 80s one appeared in my Instagram feed. 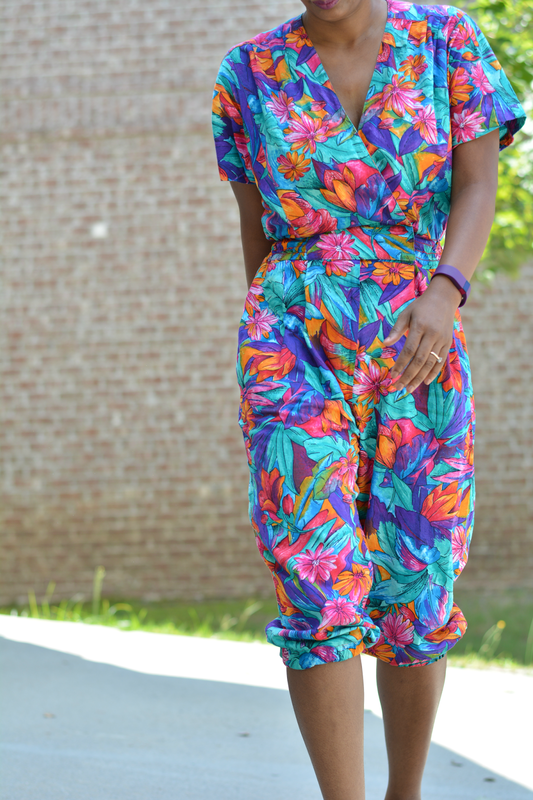 In theory, jumpsuits are the bees knees. Once you've completely disrobed in the bathroom for the 10th time in a day they become quite annoying. I decided this one was too cute to pass on and worth the awkward and chilly bathroom trips. 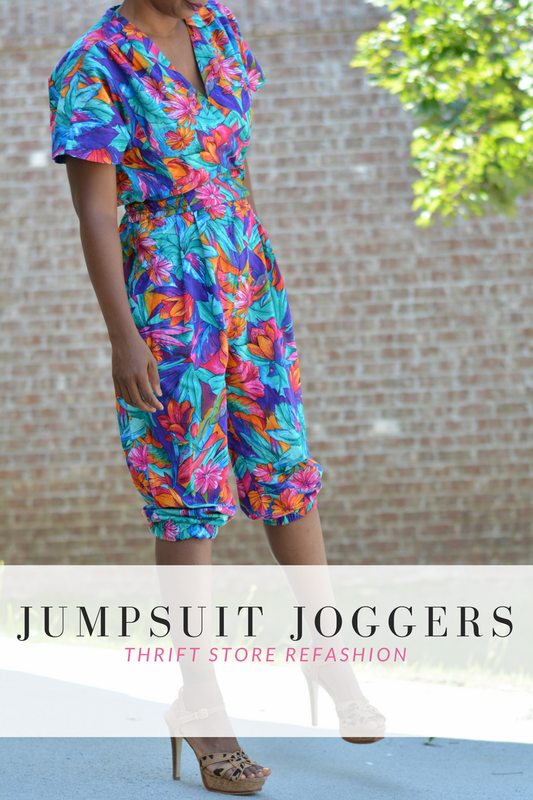 I gave it a refashion to cropped joggers as that was the faster option to a more perfect fit. I don't do a lot of Instagram thrift shopping because I like to do my own inspection on what I buy and it's hard to eyeball fit via a picture. Chocolate Shop Vintage was having a 50% off sale which prompted me to take a chance and splurge on this $16 find. It arrived in good condition plus I discovered pockets (yay!). The fit wasn't quite right though. The elastic was stretched at the waist so I just sewed in a new row following the rows of elastic thread already there. I still wasn't pleased with how the jumpsuit looked on me. The pant legs needed to be tailored as well. They were just kind of hanging there not really doing anything for the look -- a little too long and baggy. I cut them off and added elastic to make them capri joggers. Knickerbockers were my jam back in the "olden days". I love elastic for its ability to shape garments without difficulty. It tops my list of essential refashion tools every thriftanista needs. 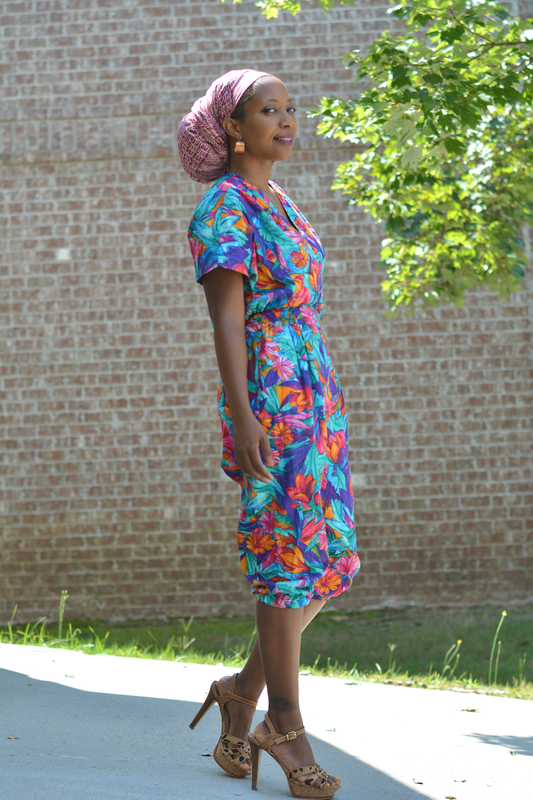 It's very forgiving if you're a sewing novice or just in a hurry to wear your awesome new thrift find. Instructions: Cut pant legs to mid calf length. Measure elastic to comfortably fit just below knee. 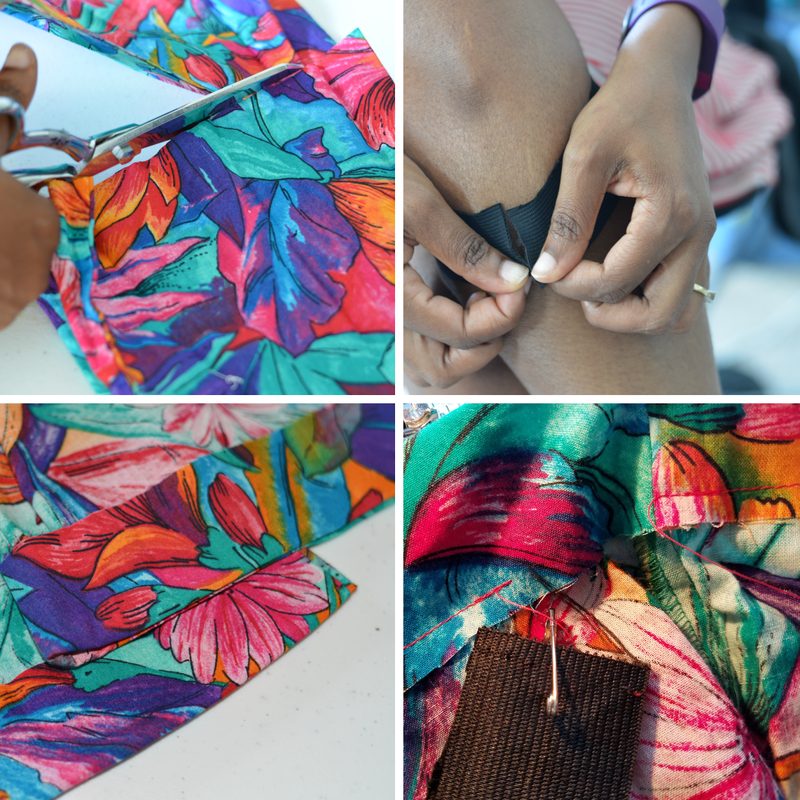 Make and sew casing for elastic. Leave an opening for elastic to go through. Insert elastic. Sew remainder of casing closed. Done. Only takes 30 minutes, tops! 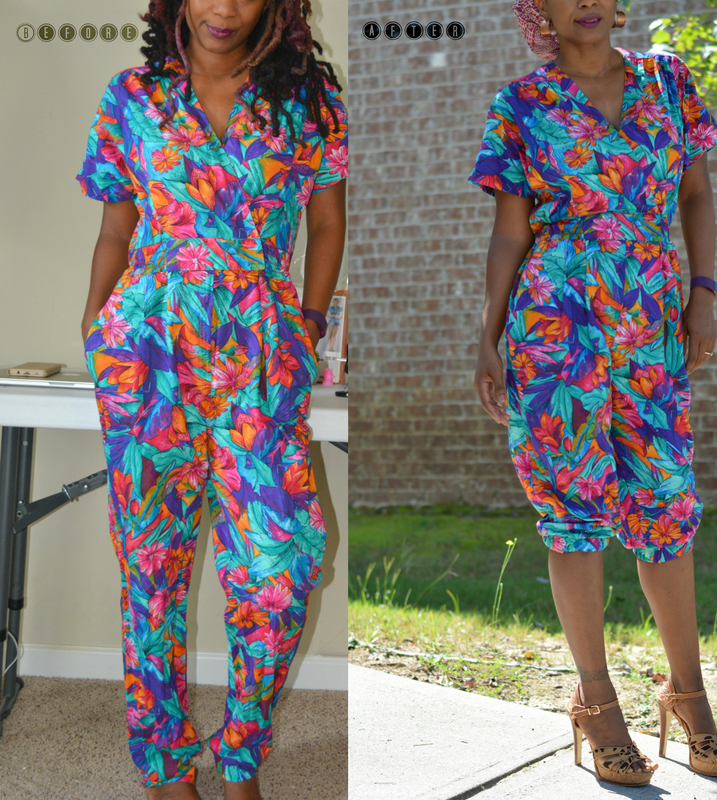 Do you have a love / hate relationship with jumpsuits?